In England we used to speak of Wembley's "hallowed turf" in the build up to the F.A. Cup Final. Everyone knew the phrase, though it is not said much anymore. Tottenham Hotspur's game against Manchester City on the 29th of October saw the playing surface of our national stadium appear more like a chewed up third division ground from the 1970's. Hallowed ground? A desecrated temple, more like. Wembley's green lawn that night was a badly scuffed and muddy disgrace in its middle section, with the ersatz lines of gridiron and the faded red and blue inks of a big NFL logo staining the centre-circle. The narrower dimensions of the gridiron field were clear from the long scarring on either flank where the army of NFL players and assistants stand for most of their games (picture from Evening Standard). Only a day earlier the mastodons of the Philadelphia Eagles and Jacksonville Jaguars had fought out a competitive American Football match over three gruelling hours on the same pitch. There was no way in heaven it could have been ready for Premier League football 24 hours later. 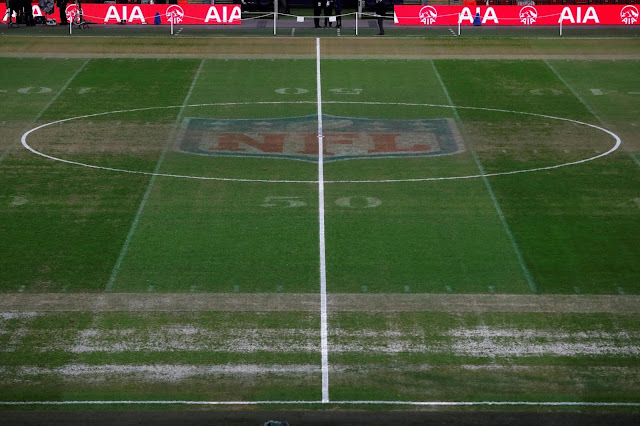 Of course, Spurs were only playing at Wembley because their new arena in Haringey had not been finished in time, but three NFL games and an Anthony Joshua boxing match have damaged the playing surface quite seriously. Barely two weeks earlier the Football Association had declined Jaguars team owner Shahid Khan's bid to buy the stadium for £600 million, following a lack of unanimity on the FA's council and the support of only a third of the consulted public. Khan wanted to move the Jaguars from sunny Florida to drizzly Brent and make them a permanent London 'franchise'. With sell-out crowds at Wembley the expectation of a London NFL side has now reached fever pitch, but it is surely time to cool this fervour. After witnessing the appalling state of the grass at the Spurs v Man City match, it felt like the rejection of Khan's plan was an almighty deliverance from the prospect of having around ten NFL games at Wembley instead of the current three. Spurs ironically have signed up to host two NFL games at their new ground next year but will not be the new base for a team. Unlike at Wembley, there is precious little space for tailgating at White Hart Lane and the neighbourhood is not London's most attractive. The NFL is welcome here but it must aim at building its own arenas, just like MLS teams have done in the USA having moved on from unhappy ground-sharing with NFL clubs. But Khan's plan was different as it involved buying and taking over Wembley, our national stadium, for the primary purpose of hosting American Football. If the game's homeland still has anything approaching a soul, that must be a non-starter. But is that rose-tinted romanticism? The twin towers have been demolished, the field where Bobby Moore raised the Jules Rimet aloft has been turned 90 degrees, Wembley Way is not a majestic avenue but a mundanely tiled walkway flanked by concrete warehouses and malodorous fast food stands. But if football means more than just an entertainment option, it must have icons and sacred spaces. Football need not be the only game to be played at Wembley but it must come first and foremost. American football and other sports must gracefully know their place there. In short, it is time to bring back the hallowed turf.